Yeosu is one of the South Korea’s most picturesque port cities– especially at night. Famous for its seafood, beaches, flowers and marinas, it is developing as an international ocean resort and tourist destination, as well as being selected as a host city for the 2012 World Expo. The city of Yeosu consists of the Yeosu peninsula as well as 317 islands (49 inhabited, 268 uninhabited). You can find your own niche here, and have your own little piece of heaven along with it. Lying about midway along the southern coast of South Korea, Yeosu has cool summers and mild winters thanks to the sea wind and warm current. It harbors a blessed ocean climate, with relatively longer springs and autumns than other regions. One landmark that makes Yeosu so scenic at night is Dolsan bridge, a beautiful bridge with changing lights that give the evening a magical sensation. Lots of seafood restaurants and romantic cafes sit around the area, taking full advantage of the view. This is also a great place to be for the beach life. Manseongri Black Sand Beach is the only black sand beach in Korea, and it’s the liveliest beach in Yeosu, with lots of restaurants and cafes along the striking coastline. Another must-see in the harbor is a full-size model of one of Admiral Yi’s turtle ships, timber shelled vessels which were used to defeat the Japanese navy. Perhaps the best way to experience the city and its surroundings is to take an ocean cruise. Dozens of different cruises hop between the many different islands– and you won’t be able to resist the allure of those islands once you see them in the hazy sunrise. One of the real culinary treats of Yeosu (and South Korea in general) is the sashimi-like raw fish, which unlike familiar Japanese cuisine, is often enjoyed with spicy and sour sauce, wrapped in lettuce along with garlic. Another specialty of the city is Gat Kimchi, made with mustard leaf from Dolsan Island. 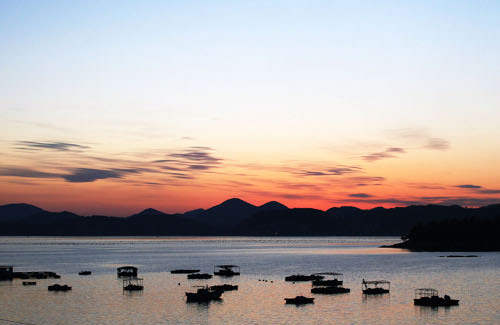 Yeosu has everything you might expect from South Korea– the environment, the food, the people, and the scenery. With a population at just around 300,000, it’s got all the amenities you might need and easy transportation in and out. But be warned, once you’re in you may never want to leave!